Ellen Greene at the 4th Annual GLSEN Respect Awards. Ellen Greene at the Sneak Preview of ABC's "Pushing Daisies." Ellen Greene at the 2007 Summer Television Critics Association Press Tour for ABC. Ellen Greene at the 9th Annual Family Television Awards. Ellen Greene and Lee Pace at the 9th Annual Family Television Awards. Ellen Greene at the Paley Center for Media's 25th Annual Paley Television Festival. Ellen Greene and Christian Klikovits at the "Movies Rock" A Celebration Of Music In Film. Ellen Greene and Anna Friel at the 8th Annual AFI Awards cocktail reception. Ellen Greene at the "Movies Rock" A Celebration Of Music In Film. Ellen Greene at the 2007 ABC All Star Party. 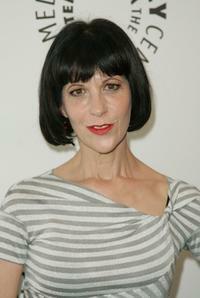 Ellen Greene at the ABC's sneak preview of "Pushing Daisies."